As the color of Earth Herself, brown is a very powerful color indeed! Brown evokes strength and security. Brown is grounding and strengthening. It improves focus and promotes generosity and abundance. Perhaps most importantly, it is the color of animals and nature magic. Brown connects us to all of the other, non-human, living souls with whom we share our world. The outline of a large daisy is laid out in black dots. Among other things, the daisy represents childish innocence, In Norse myth the daisy was the flower of Freya, a goddess of love and fertility. Taken together, the brown background with the outline of a daisy, this bag attracts powerful earth energies! 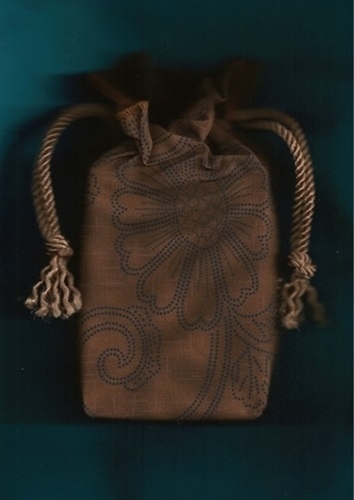 This Brown Realm Double Draw Tarot bag is ideal for guarding your nature- or animal-themed decks, like Animals Divine Tarot by Lisa Hunt. It also pairs well with decks that have lots of rich, earthy colors, like Crowley's Thoth Tarot. Of course it's utterly perfect for guarding your steampunk themed tarot decks too, especially Deviant Moon Tarot by Valenza and Steampunk Tarot by Moore and Fell.